It’s been a busy year since we first bought this car. 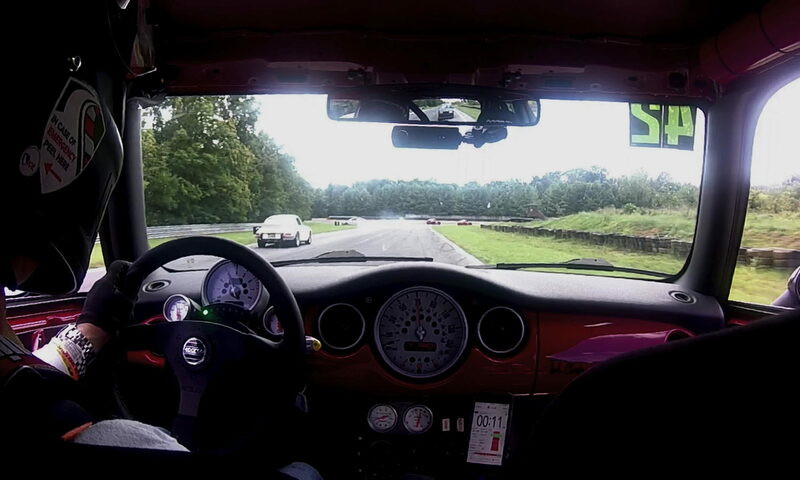 Our goal was to find a low mileage ’06 Cooper S that could eventually be modified for club racing. Keeping in mind that the cost difference between an R53 Cooper S and JCW is about $5,000, we wanted to make this car better than a JCW model, without completely sacrificing creature comfort as a daily driver until we were ready to gut the interior and install a cage. I think we’ve brought it right to that edge: It’s stiff, but not jarring. And it’s fast. Given that the majority of R53 Cooper S cars were sold with sunroofs, finding the right car proved harder than you would have thought. We found a 45,000 mile car, with heated Punch Leather seats, a factory limited slip differential, and fog-lights — no other options or packages. This August we replaced the clutch, ball joints and rear main seal just to baseline the car, but it really was in terrific condition. 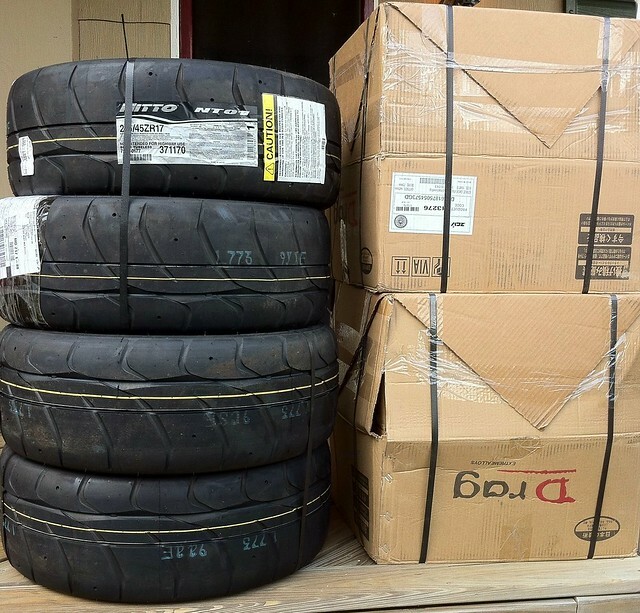 The boxes above contain the last phase of our initial sorting: getting power to the road through light-weight wheels and grippy tires, in this case Nitto NT-01 R-comps which we’ll scrub-in at a test-and-tune autocross event in Frederick and then we should be ready for the track coming up in two weeks. Handling — We added an H&R 27 mm front roll-bar with Alta adjustable end-links and Powerflex control arm bushings. Previously we installed an Alta 22mm adjustable rear sway-bar (now set to the stiffest setting to compensate for the bigger front bar) and adjustable end links. 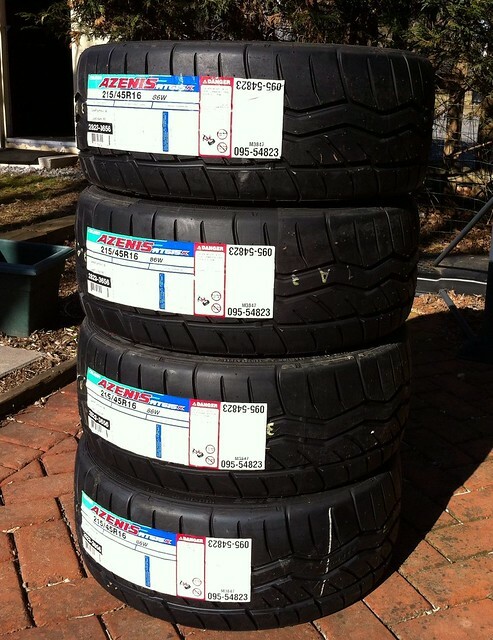 Suspension consists of Bilstein Sport shocks and struts over Bavarian Autosport Performance Springs. We have Powerflex shock bushings in the rear and Eibach adjustable camber plates in the front. Suspension settings are 1.7 degrees negative camber in the front, 1.5 degrees negative camber in the back. (That’s the most negative camber we can get in the front without binding the springs.) Front toe is neutral, slight toe-in for the rear to increase straight-line stability. In the rear we also have H-Sport adjustable control arms to compensate for lowering and to beef-up what’s normally a weak link in the MINI stock suspension. To increase chassis stiffness, we have a strut-tower brace in the rear, Madness Lower Stress Bar in the front, and MINI OEM Cabrio cross braces. To improve braking, we added JCW brakes up front, stainless steel brake lines all around, and brass bushings to the rear brakes. Power — MINIs have the aerodynamics of bricks so power improvement isn’t ever about top-end as much as it is about mid-range torque. We have a Madness 15 percent reduction pulley, Screamin Demon Coil, MSD plug wires and NGK Iridium plugs. On the intake side, we are using an ALTA intake and intake hose along with an ALTA intercooler diverter. On the exhaust side, we’re using a Scorpion stainless steel free-flow exhaust. The Scorpion exhaust is lighter weight than stock and has a nice deep tone without droning. Behe performance provided the custom tune to take advantage of all the changes. Currently, this car dynos at about 198 whp. We could increase it to get above 200 by increasing the rev limit setting, but frankly we’re more interested in power from 4500 to 6000 RPMs than we are watching pieces blow through the cylinder walls at 7200 RPM. We want this lump to last 200K miles or longer. Information Management — We’ve brought over the FES-Auto shift-light from our previous R53 and added a new telemetry system this year. We’ve outfitted the car with a PLX devices wireless network adapter that feeds telemetry data to an iPhone. Now we can log data as well as add telemetry data to in-car videos. Cost total: Excluding the clutch and ball-joints which were just routine maintenance items, we’re just $300 shy of our $5K budget. That’s pretty good considering all of the changes we’ve made so far.